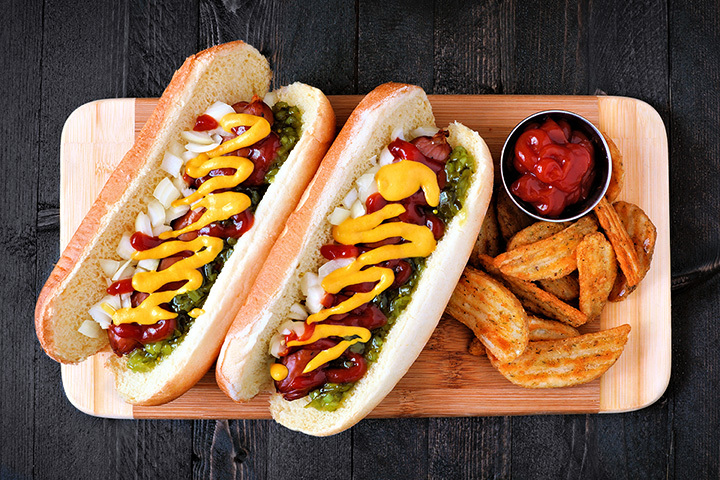 Like the national Pizza Wars, a favorite hot dog is a choice between two cities. Sure, there’re variations, like LA fresh-fusion or Sonoran or Wisconsin. But there’s only one real decision: New York or Chicago? It’s either the no-BS of the Big Apple, a kosher dog with onions and mustard, or the poppy seed-wrapped and veg-heavy style of Second City. A mix of modernizing cowpokes and Tweeting university students, Montana’s selection of franks is as eclectic as its population. The cartoon dog at the entrance of this otherwise nondescript corner building sums the experience: Quirky, unpretentious and no-frills. But don’t let the casual, borderline-tacky diner decor fool you. This is the spot for a decent Chicago dog: A soft poppy seed bun, warm to the touch, surrounding a toothsome sausage, balanced by the bite of raw onion and vinegary mustard. Prices are higher than the usual dog cart, but the quality food, executed by some legitimate chefery, proves the cliché: You get what you pay for. A local meat mecca in Big Sky’s mountain village, Yeti is the epitomic hot dog joint. In the backdrop of snowcapped Montana skyline, the simplest dog is elevated to a gourmet experience. Be it the high elevation, or the exhaustion of a full ski day, the dogs here just taste better. For the traditionalist, get the “Truck Stop,” simply mustard and relish, or try the “Ono” if feeling adventurous: It’s got tangy barbeque sauce, pineapple and bacon. This shop with a chalkboard menu embodies the modern-yet-casual hipster diner. Orders are made at the deli-counter, served on no-nonsense checkered paper, and red leather booths along the wall allow diners to sink in and scarf. It’s sizable NY-style sandwiches notwithstanding, Paulie’s has an ideal, concise selection of dogs. The only problem is deciding on a regional flavor: ‘kraut and mustard (New Yorker), pickle, pepper and tomato (Chicago), or avocado, jalapeño and sour cream (Cabo Wabo). The brand synonymous with solid burgers and shakes, Five Guys sports a pretty good hot dog, too. A Washington, D.C. staple, the chain is now found throughout the West, with notable Montana branches in Bozeman, Missoula, Kalispell and Billings. The simple wiener is split down the middle, flash grilled and rests on a golden-brown bun. Choose your toppings, and feel free to gild the lily with bacon and/or melted cheese. Among its many natural assets, Montana has a wealth of high-quality beef. And this advantage is immediately apparent biting through the casing of an all-beef dog. This white-and-red food truck scoots around the university town of Missoula, exhibiting a modest, rotating menu strictly focused on 3-5 hot dog varieties. Try the polish sausage, or the truck’s signature, “Dogzilla,” loaded with grilled veggies, peppers and cheese. Nestled in a lakeside park, Boardwalk is a regional contender for best burger and renowned for its huckleberry shakes. But it’s hot dogs are dang good, too. And along the shores of Flathead Lake, the scenery adds a je ne sais quoi that transcends the usual dog experience. There’s the ubiquitous, and necessary, kraut, onions and mustard version. And feel free to pile on more eccentric mounds of cilantro, jalapeños or chili. Vinny’s is a nostalgic encapsulation of the Midwest and East Coast metropolitan streets carts. Its focus is two-fold: Hot dogs and Italian beef sandwiches. While both are top-notch, this food truck is an excellent spot for a Chicago dog, that snack that hits all the taste buds: Savory Montana raised-beef, briny pickles and mustard, spicy sport peppers, fresh tomato and that scrumptious poppy seed bun. Approaching a 75-year run, Bonanza is a welcome remnant of the diner-style heyday of the mid-20th century. Though much of the draw is dessert, especially the shakes and malts, they’ve also maintained the no-fills approachability of the three incarnations of classic hot doggery: Regular, chili and foot-long. Given the disappearance of 39-cent hamburger stands and the drive-ups of decades’ past, the nostalgia of a straightforward steamed hot dog at Bonanza never tasted so good. The name leaves nothing to the imagination: Nation’s is a burger joint. But locally-sourced, prime beef isn’t only for patties: It also comprises a delicious kosher-style hotdog. They’ve the usual diced onion, relishes, kraut and sauces, but a worthwhile guilty pleasure is the messy chili-and-cheddar dog. Grab a handful of napkins, loosen the belt, and leave your inhibitions at the door.